Diane Lockie wrote 'My Dad Peter Newman worked at Ranton's & Co Ltd from 1950-1991 in Commerce Road Brentford. The company moved from Cricklewood in July 1939 to Commerce Road.' Diane scanned some photos from an album given to her dad when Ranton's closed down. One shows the workforce in 1949 and Jean Banaszak, Sam Fox, Stephen Privett, Rosemary Davies, Patsy Langley, Joyce Marchant (nee Stockley), Christine Sheppard (nee Payne) and Chris Mundell (nee Lewry) have contributed memories and names. Chris Mundell has also prepared a key which follows the workforce photo. The first photo shows the frontage of Ranton's in the 1940s and signage shows they were plastic moulders. At first glance the three cars parked outside appear to be Matchbox or Corgi models, but the second photo also shows them and I concluded they are real. Fay Twydell has provided a photo of the Ranton building frontage taken in 1997. 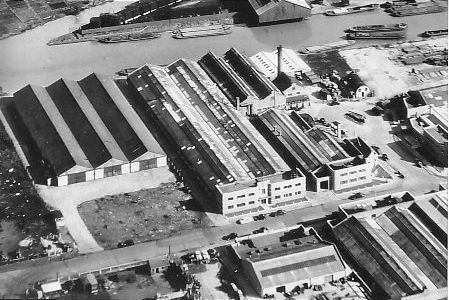 The location of the Ranton's Art Deco Building is shown in the aerial view: behind and running alongside the factory can be seen the Grand Union Canal. The River Brent is visible near the top of the photo with the slip of land between the waterways. Google Streetview shows SPS (Show Presentation Services: Audio-Visual Equipment & Supplies) here in the early 2000s. Diane has also sent a scan taken from a brochure dating from 1946 which gives the address as 'Rock Works, Commercial Road, Brentford High Street, Middlesex (near Canal Bridge). The brochure shows the company made bakelite electrical accessories. 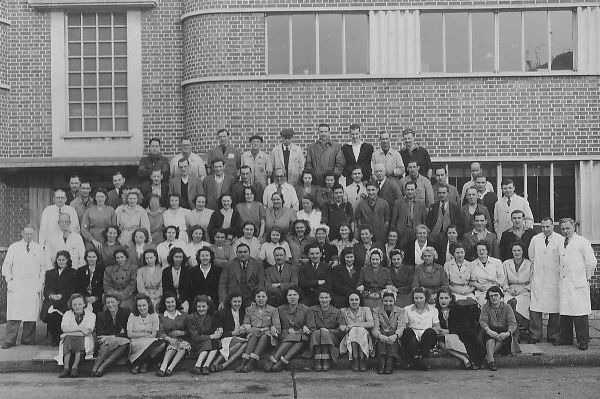 Diane has also provided a scan of a photo showing the workforce, taken in 1949: over 90 people. Some wore white coats (technicians? ), there are three men who look like bosses (suits and ties) and men who worked in the factory (brown overalls) and women from the factory and offices. It looks quite a chilly day - some of the ladies on the front row are wearing ankle boots. Sam Fox, August 2011: I was interested in the photos of Rantons sent in by Diane Lockie especially as I am in the group photo top left hand corner, I knew Dianes dad Peter as I worked there 1948 to 1960. 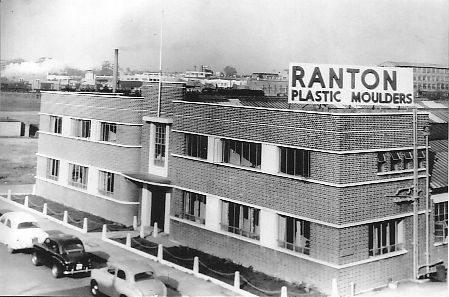 Rantons was a very family orientated company with several generations of the same families working there at the same time, there are three members of my family in the photo. I met my late wife there, I am now with one of the ladies in the front row of photo, third from the right we are both in our late seventies we were sixteen when it was taken. The men in the suits from the left were Mr Humpheries the works Manager, in the middle Major Brooke-Hitchen ex military man, I cant recall the other ones name. The photo only covered about 60% of the workforce as it was taken one lunchtime, also there was a night shift operated. Other firms in Commerce road were Permutit water softeners Elizabeth Shaw, chocolate factory and Sycamore woodworking company. There were always plenty of jobs going, and it was not unusual for girls to leave Elizabeth Shaw on Friday night and start work at Rantons Monday morning and vice versa. Jean Banaszak wrote in October 2011: My mum used to work at Ranton's when she was a young girl, she became ill while working there by getting powder on one of her lung's. Her name then was Phoebe Francis, my mum passed away in 2006 at the age of 81. Stephen Privett, August 2012: I was just looking at the old Rantons Factory and It bought back memories for when I worked for them. I was with them for a few years in the early seventies. My Grandfather also worked for them ( John Beasley) He was a lorry driver for them. One of my neighbours also worked there ( Sid Gomm) he was a charge hand on one of the shifts in the moulding department. One of my Boss`s was called Bill Monton. I can see some old faces but can't remember their names , but I know there was a few that worked there were related. I worked in the stores department. I also remember that there were such things as a firms outing. One of which was a day trip to France. A couple of other names I`ve remembered. John Wild who was the main Manager at the time I was there. Harry who surname I cant remember, but he was well in his 60`s when I was there and he was my supervisor in the store`s. My main job there was to check in the work from the moulding shop all the items had to be weighed Because this was how the lads who operated the moulding machines got paid, they were on piece work. Another name comes to mind Alfie Horn he worked in the machine repair shop. A lot of the work force there at Rantons were Asians and on a few days a week Rantons had some folk with special needs come in from the care home up the road. Rantons also did home work you got paid by the gross. My Grandfather used to deliver them to peoples homes and used to deliver to Birmingham I used to go with him when I was younger and before I started at Rantons myself. Brentford now is far different from the Brentford I remember. A couple of other factory`s in Commerce Road was Falcon Pipes and Art Masters (paint by numbers) and also BRS road haulage`s. Rosemary Davies, February 2013: I have memories of Ranton�s as I worked there from 1966-1968. I was a Records Clerk and used an Addo-X machine. My immediate boss was Anne Cuthbert who was a lovely lady to work with. Other people that I remember working in the same office were Dot, Mr Bates, Margaret and Peter Clarke. Mr Letley had an office to himself just off the main office. I also remember a Mr Papworth. Gillian, Pam, Barbara and Leighton worked in the upstairs office. During the course of my work I often had to visit the factory floor and Elsie was in charge there. Terry and Victor worked in the stores. It was a very happy and friendly place to work. I only left because I was getting married and moving to Croydon. I was Rosemary Harris in those days. Patsy Langley, June 2013: my mum is in the line of ladies who are seated in the front, on the kerb, sixth in from the left. She has a white dress on, which is falling over her legs. Her name then was Joan Kendall. She was a factory worker who worked there in wartime and carried on after the war ended. Patsy added in January 2014: I can also see my aunt (mum�s sister) in the group. She was my aunt Molly Smith and she is located third row from top, ninth in from the left. She was big breasted and also worked in the factory alongside mum. She died in 1995 and mum died in 2011. Joyce Stockley, February 2014: I worked at Rantons for about 2 years, 1954-56, my cousin Peter Newman worked there and as I was leaving school he reccomended me to go to work for Rantons. I was 15yrs at the time, my job was to polish off the filed edges of the plate, dishes etc. I do not remember many people, but Reg was the chargehand , and I do remember Alfie Horne, also the person who helped me to settle in my first employment and a very good friend was Miriam Dallibar. Peter Newman worked there for many years, after I left I went to Walter Robertson, at the top of the road, by Brentford Bridge. I enjoyed working at Rantons, because everyone was so helpful and friendly. Christine Sheppard (nee Payne), March 2014: I worked at Rantons between 1963 - 1966 I knew some of the people in the photo. Sam Fox lived 2 doors away from me, and the 3rd lady on the bottom row I think was my sister as she worked there then. I have fond memories of working at Rantons. My mum worked there in the canteen when I was small, I used to go to work with her, I remember Mr Smiles and Bob Cox when I was a child. Chris Mundell (nee Lewry), November 2016: My father Frank Lewry, who will be 91 this month, worked there from about 1952 until he retired. He started out in plastics design and ended up as the Technical Director. The 3 white coats on the left, the top one is Bob Tharby and on the right of the picture in the white coats the one on the far right is John Smiles who was studying structural engineering with my father at college and was in the Territorials where his commanding officer was the son of a chap who owned a plastics company so John went to work for him and later brought Frank Lewry into the company. My father has very happy memories of his working life there. Please get in touch if you can add any names or have memories of Ranton's.